The City of Indianapolis and State of Indiana have been wonderful partners, providing a supportive business climate that allow us to grow our output and employment. -- ALOM President and CEO Hannah Kain. ALOM, a global leader in supply chain management, has crossed the 1-million order milestone at its Indianapolis production and fulfillment facility. 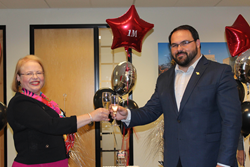 City and County of Indianapolis District Councillor Jared Evans and ALOM CEO Hannah Kain led a celebration recognizing this achievement and acknowledging the operational success and continuing growth of its Indianapolis facility. ALOM has already outgrown the original 48,000 square foot Indianapolis facility located at 2670 Executive Drive and is using an additional 12,810 square foot space at 2655 Fortune Circle. Next year, the company foresees further expansion with a doubling of its Indiana footprint. “One year ago we opened this state-of-the-art facility in Indianapolis and today we celebrate processing its one millionth order! What is most exciting is that in achieving this milestone we met stringent six sigma quality metrics and our proprietary ecommerce order management technology is poised to double our processing capacity from this location in 2019. In addition the City of Indianapolis and State of Indiana have been wonderful partners, providing a supportive business climate that allow us to grow our output and employment,” said ALOM President and CEO Hannah Kain. “The City of Indianapolis is pleased to celebrate this achievement with ALOM. With an innovative spirit and ‘can do’ attitude, ALOM joins our City in increasing economic prosperity for its employees and our community,” said Jared Evans. Supported by advanced order management and automation technology, the Indianapolis facility adds warehouse and production capacity to meet growing customer demand and faster delivery with shorter transportation routes to Midwest and Eastern region destinations. The ALOM Indianapolis facilities provide leading global brands in the automotive, technology, and medical device industries with innovative supply chain strategies that enhance the end-user experience. They are part of ALOM’s multi-year expansion that includes a state-of-the-art 110,000 square foot addition to its US global headquarters in Fremont, CA, now totaling 260,000 square feet, and its new European headquarters in Amsterdam, The Netherlands. In leveraging both proximity and regional knowledge of regulatory standards, ALOM can provide customized, technology-driven solutions that enable its customers to compete successfully in an increasingly complex global marketplace.